Know when and where an email is read! Email Tracker will let you know who reads your emails, when, from where, and on which device they do so. 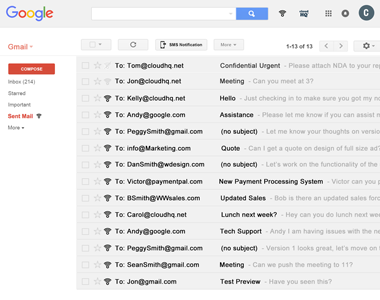 Free Email Tracker is fully integrated with your Gmail. 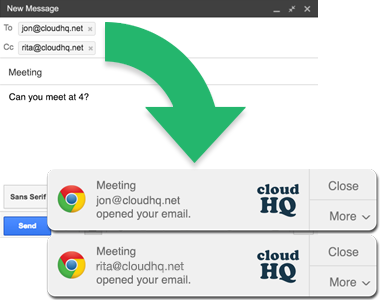 There is no need to actively “turn on” tracking for individual emails. By default, all your emails will be tracked. 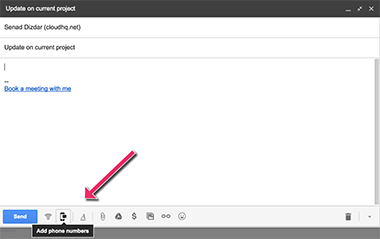 To turn off tracking for an individual email, simply click the icon in the bottom of the compose message so it turns light gray. You have no limits when using our email tracker- whether you’re using the premium, or the free version. This way, you’ll be able to know exactly when a critical sales lead or customer has read your email, and you’ll always be able to take any necessary follow up actions. We spent a lot of time designing a great email tracking experience, and it includes never having to limit you so that you can soar to your fullest potential. Location tracking feature is one of several email analytics tools that we offer for free. Location tracking allows you learn recipient's geolocation and detect your recipient's device. For example, you can detect if your email has been opened on a desktop or mobile device. Email Tracker also provides a map showing the location of the recipients when they opened your email. Do you need a high level overview dashboard to see whether or not your emails are being opened? 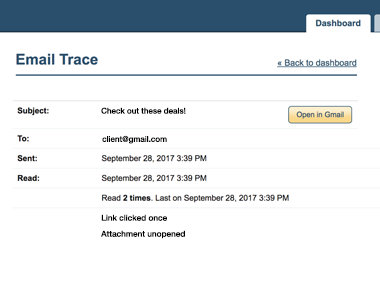 This free dashboard functionality keeps a record of all your emails sent with Free Email Tracker. You can check the history of your tracked emails in one, convenient place. Filter all your messages that haven’t been opened, and you’ll be able to know what actions to take next. Click the “read emails” option, and you’ll know which of your contacts are taking you seriously. 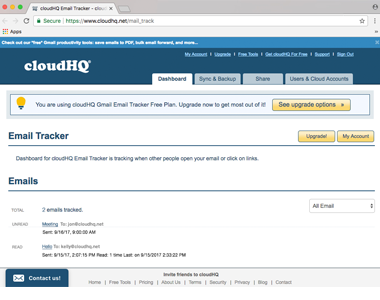 Free Email Tracker will also track multiple email recipients when you include more than one email address in your email. You can send your email with blind copies, copies, or multiple address in the “To” field, and still track if they opened your message, and clicked on any of your links. 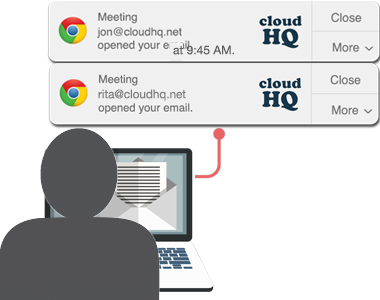 Desktop notifications for email tracking are designed to alert you in real-time as soon as your tracked messages have been opened while you’re on a desktop computer. They’ll pop-up from your taskbar just like Gmail’s new message alert. Because notifications are shown in real time, you’ll have the ultimate upper hand. The unlimited link tracking feature is one of several email analytics tools that we offer (premium plan required). 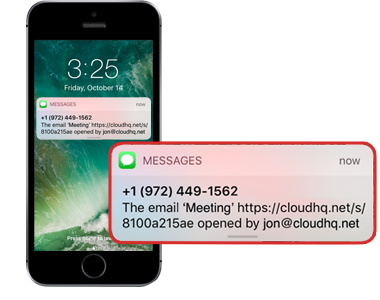 Link tracking allows you to know whether your recipient is interested in what you sent them, when you’re email tracking them. You can check when and how many times they opened your link, and be ready to follow up with the best information in hand. If they didn’t click on your link, you know they might not be interested in what you’re sending them. You can check the history of your tracked emails in one place. Filter all the messages that haven’t been opened and know what to do next. Click the 'read emails' option and make sure you know who are the contacts that opened what you sent. Using the filtering, you can see a full history of your communications with specific prospects as well as their history of how they interact with your messages. With reminders, you can receive a notification if your email goes unopened for 48 hours. This gives you a heads up that the email you're using didn't reach your intended recipient. It could be that the recipient is busy, is away, or worse, is ignoring your emails. Whatever the case, an email notification will alert you that your message has NOT been read. This knowledge lets you take the next appropriate steps because your current email recipient may not be your best point of contact. In our fast and furious world sometimes people forget to respond to an email that they opened. Maybe they were distracted, or wanted to return to it later on and forgot about it. 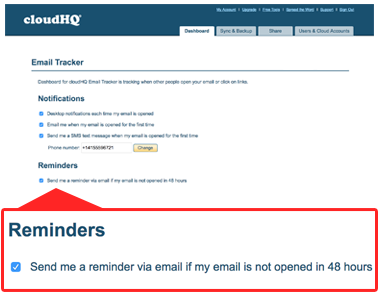 With our email tracker, you can set up a 48-hour reminder to send you an email if someone has opened, but NOT replied to your last message. Imagine that you've sent a client a proposal with a quotation, and notice that they aren't replying back, but opened it. This reminder will tell you that you should be reaching back out to see if the quotation met their expectations and how you can progress towards a sale. 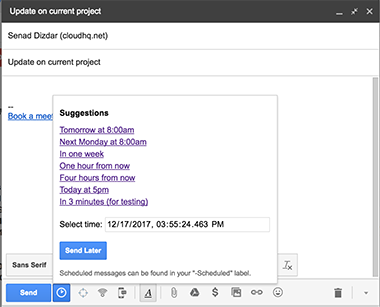 Free Email Tracker is integrated with Schedule Email so you also schedule your email for a later time - and still track them. We designed this tool with as few limitations as possible - including price limitations. Because of that, Free Email Tracker is 100% free to use for anyone using Gmail. 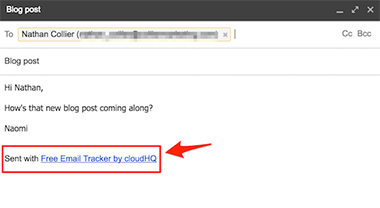 By default, we’ll include a link at the bottom of all tracked emails that lets people know you’re using our tracker. If you prefer to remove the notification, you can simply delete the link manually before sending your email. Or you can upgrade to the premium version of the tool, and we’ll remove the link for you by default. Receive a notification when your proposal is viewed, and you’ll know exactly when to follow up. Know if your email is read and not responded to, or never reaches the recipient. Know if your support message has resolved an issue or if the contact hasn’t yet read your helpful message. Send test emails and track which emails are being opened and which are converting - and see how effective your marketing materials actually are. You’re trying to get legal documents in order - is your investor forgetting to follow through or do they simply need more time? Respond to candidates at the right time to nurture their interest and without appearing overzealous by replying too often.